Since I had the chance to review aden + anais for my 'Baby Gift Guide' I have completely fallen in love with the items that they offer. As of July 2013, the brand now offer's even more of their coveted products in an organic option. Which I happen to be a huge fan of. 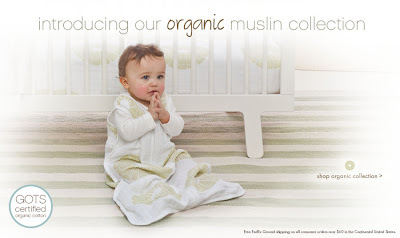 As the very first brand to cultivate a global demand for 100% cotton muslin swaddles, sleeping bags, burpy bibs, and other baby care items, aden + anais will now provide a wider range of their iconic products made with GOTS-certified 100% organic cotton muslin and manufactured in an environmentally responsible way. I highly recommend you to check out all of the amazing items that Aden+Anais offers in their new Organic Collection.